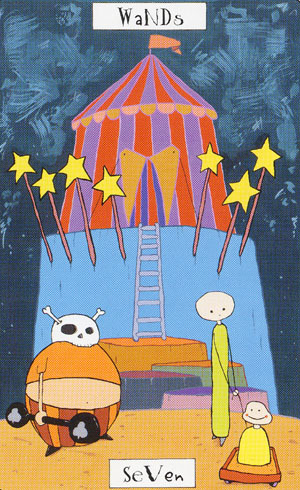 Graham's booklet says: "Three members of the Fire Wand Circus stand outside Fingerpin's headquarters. Somehow, the bridges enabling them to reach headquarters have disappeared. They have no choice but to tackle the problem. They must learn how to solve it before they can move on. Divinitory Meaning: The Seven of Wands encourages us to make an effort when we are confronted by obstacles. Reverse Meaning: Ignoring important issues, hesitation." I enjoy playing adventure games, many of which are done in a cartoon style similar to Graham's. If you've ever played one you will know what I mean when I say that this card reminds me a lot of being stuck (sometimes for days) staring at the same puzzle and trying to figure out what to do. This usually involves: 1. Talking to someone. Either someone new you hadn't thought to talk to before, or someone you haven't talked to since your situation changed. 2. Looking for a new item to add to your inventory 3. Trying to use inventory items in ways you hadn't previously considered; either on the enviornment, with another inventory item (combining them), or by giving one to a character who might use it in a helpful way. It's kind of interesting how applicable these methods are to solving problems in real life. On the 7 of Wands, three performers from the Fire Wand Circus stand a little uncomfortably next to each other. The first is a plump weightlifter with a skull for a face, and the second pulls the third behind him in a little cart. Graham writes that they have come to see Fingerpin up in his tent, but that somehow the bridge to get there has vanished. I wonder why they need to see Fingerpin - do they have some unanswered questions? Or maybe they want to prepare for the next show? Anyway, if they really want to get to Fingerpin, they’ll have to do something and will have to work on a plan, instead of standing there looking sheepishly. This card seems to be telling that when you’re faced with obstacles and difficulties, you have to make an effort to overcome them. And I reckon one of the key factors here is working together. Because they are obviously very odd, unusual characters, I have no doubt that they will think of an original solution. They stand stronger together. The strange platforms remind me of those in the Fool-card. Maybe a leap of faith is needed to solve this problem? Or maybe it’s important to have trust in yourself and others? Fingerpin’s headquarters are on a platform too. When they finally do achieve their goal, they’ll reach the top – literally and figuratively . I enjoy playing adventure games, many of which are done in a cartoon style similar to Graham's. If you've ever played one you will know what I mean when I say that this card reminds me a lot of being stuck (sometimes for days) staring at the same puzzle and trying to figure out what to do. Galadrial, it's such a coincedence that you should mention this! I have been stuck on the same spot in a playstation game, but today there was finally a breakthrough! It is very clear that the characters have an objective. There is two characters who would be able to jumb without difficulties but there would be some problems with the third one. All three characters have to find a solution that will permit them all to access the plateformed tent.